Anybody have some good Trans-Am engine compartment photos they would like to post? thermostat housing, possibly to elevate the upper radiator hose away from the fan belt. Click here for comments about the water pump pulley. 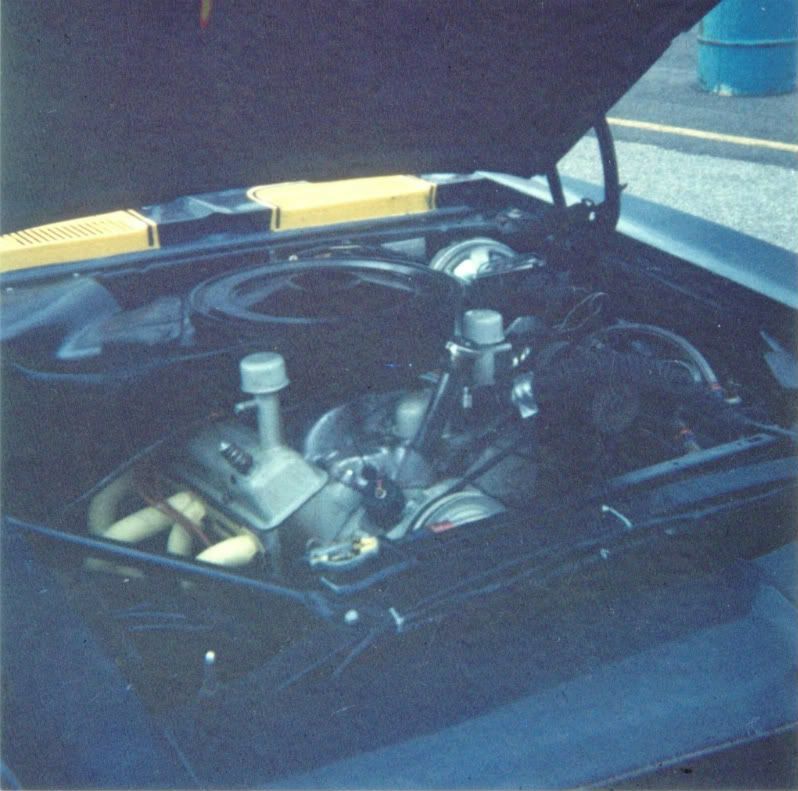 Photo of the Penske Camaro's engine compartment, taken at Marlboro, MD, August 12, 1967. Fisher co-drove the car for this race. Notice the Bill Thomas/Douglass headers, painted yellow. Anyone know why they pulled the power brake booster on the Guldstrand Camaro? see what else may be on the upper hose besides duct tape but that's as good an image as I have. Beyond what Jon said, I'd bet a majority of the early Camaro Trans-Am race cars ran without a brake booster. Unless set up just right, assisted brakes lack the "feel" of a full manual set up. With an over assisted power setup it can be too easy to lock the wheels under threshold braking. Of course the Penske/Donohue Camaros made power brakes work, and so did some independents... but I still think the majority of the rest ran a full manual set up. One of my favorite engine bay shots. Taken by Dave Friedman, this shows the Chevrolet engine in Jerry Titus' '69 Firebird at Mid Ohio. The twin Holley Dominators were perhaps a little large, and I understand that they were only used on this one ocassion. The engines were built by Dave Billes' Performance Engineering Ltd, the company decal can just be seen on the front runner of the manifold. There is plenty of other detail to take in for the keen eye. 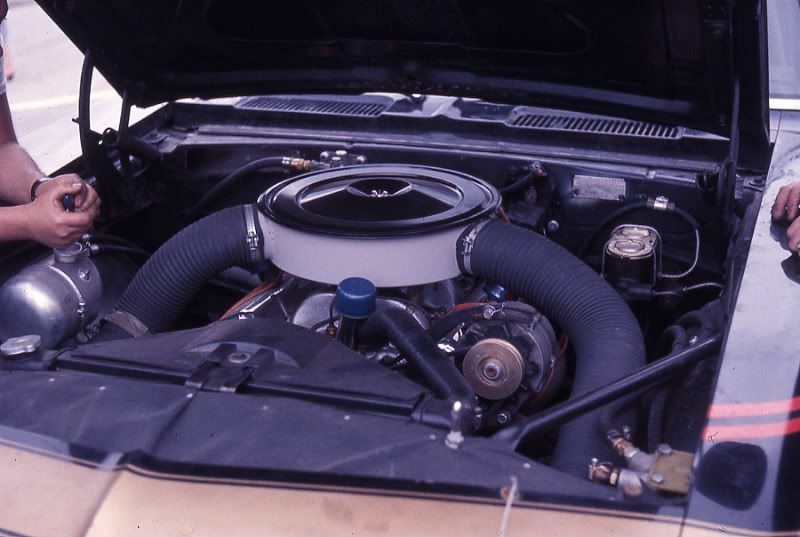 This engine shot (photographer unknown) is the Joe Miller backed, Paul Hecker driven, # 19 '69 Camaro, better known as the (ex) University of Pittsburgh car. This pic was taken at Watkins Glen 1972. Again, some neat details to be seen. Hey Bruce, thanks for posting the photo of the Titus engine. 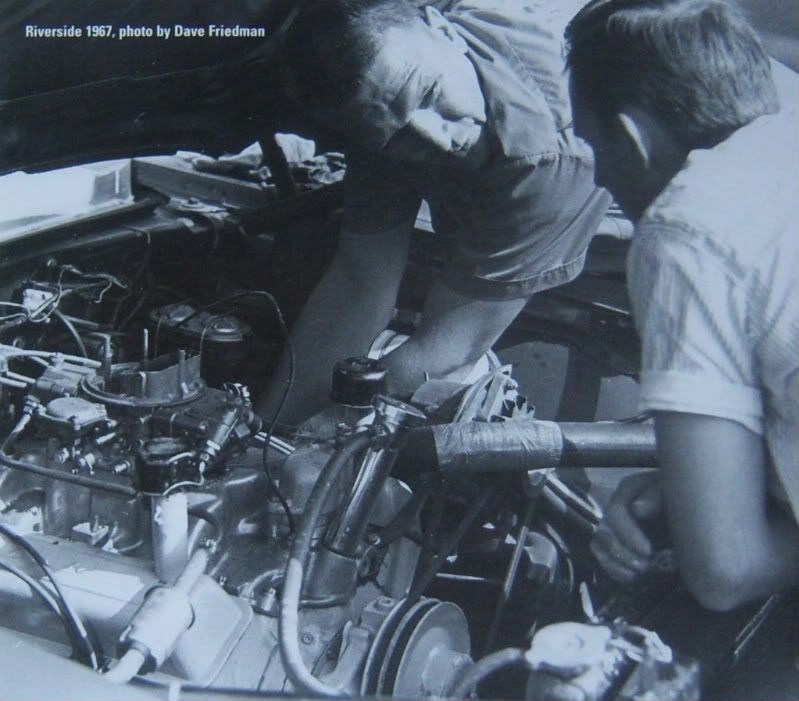 I'm kind of curious how the TG team was able to use that manifold and carburetor set-up. Was that something Pontiac had homologated on the proper SCCA forms or did the tech inspectors "look the other way" for that particular race? I assume they wanted to run this for a top-end boost and see how it performed against the Boss 302, which was also biased more toward top-end power rather than mid-range. Have you spoken with Dave Billes about this set-up? Another page shows the Edelbrock cross ram manifold. There was still a lot of rivalry between Chevrolet and Pontiac at this time, despite both being part of GM, they were competing for sales and market share as they would with Ford and Mopar. T/G Racing had a friendly Chev parts man who would source the good racing parts for them, but if asked who the parts were going to, he would name one of the local Camaro racers. SCCA papers generously provided by Chad Raynal. Thanks, Bruce. Hey Chad, would it be possible for you to post the Firebird SCCA paperwork you have? I've never seen it before and would love to see more. Here's a photo of Craig Fisher's 302 engine in his '67 Gorries "Black Panther" Z-28. This was taken during tech inspection for Sebring, late March 1967.
removed and modified for Sebring. 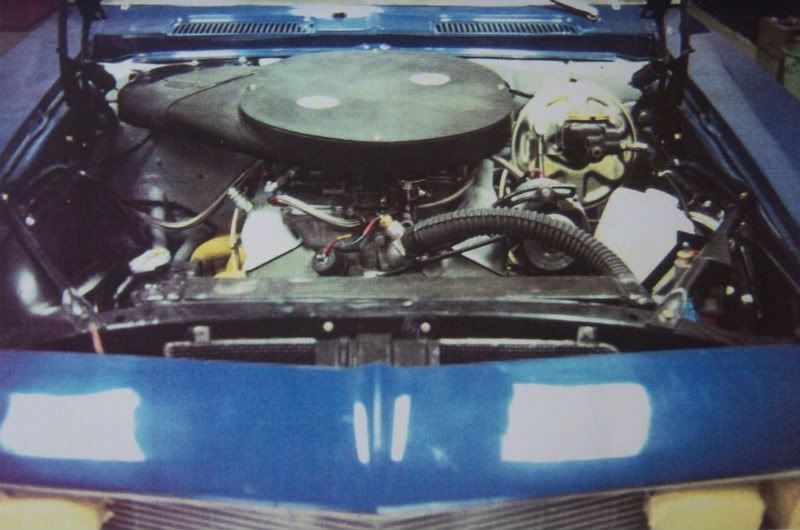 Here is a photo of the original '68 Penske Camaro's engine compartment. This is the one that started the '68 racing season at Daytona. Unbelievably cool photo. Thanks Jon. The rock guard with the perimeter frame that bolts to the radiator support is a very nice detail that also looks to be very well made. Of course, given Mr. Fournier's fabrication skills, that's not a surprise. Looking at the rock guard on this car brings me to another thought... It sure would be neat if Mr. Fournier took photos of the efforts to cut down the radiator support and droop the nose on these Camaros. Yes, that sort of thing (and other stuff too) definitely occured. I remember a conversation I had with Dan Lipetz, the current owner of the '70 Parnelli Jones Boss 302. He told me you can't take a stock '70 Mustang fender and hang it on the front of a (Bud Moore built) Mustang like his. It won't come close to fitting. He said you might as well be trying to hang a Camaro fender on it. His point was the fender was sectioned and modified to decrease the frontal area of the car and lower the nose. These sorts of changes occured less as you moved down the food chain from well-funded to low-funded teams. According to the book Cherolet Racing Penske used a trick on his fenders too. They weren't allowed to add material for fender flares so they heated and stretched the metal. Also heated and bent the rear axle housing to get a little camber to, just Nascar does.